I first went to Antarctica by plane as part of an American party in 1968. After vapouring on to everyone for over three decades about how startling, how cleansing, how life-transforming a place it is, I seized at last a chance to go again as an Antarctic tourist on the chartered Russian icebreaker Kapitan Khlebnikov, which would succeed in taking us as far South into the ice as a ship can go. We left in February last year from the same port, Lyttleton, New Zealand, as the classic expeditions used to. The Southern Ocean was relatively kindly. Icebreakers roll side to side, not in the rather more complex rolling, yawing and pitching which causes sea sickness even in ocean liners. We had to learn quickly to walk leaning backwards or forward at angles which, when photographed, had comic appeal. On the way south, we landed at two of New Zealand’s SubAntarctic islands, Enderby and Campbell Islands. These were not only remarkably atmospheric, but were marked by the extraordinary megaherb plants, which grow gigantically to absorb as much sunlight as possible. Both islands had huge populations of seals, the bulls lolling on the beaches and in the undergrowth with their harems. Campbell, to the south, was the huge breeding ground for albatross, and climbing a saddle, we found ourselves amongst these giant, magnificent, roosting birds. I should say now that the Zodiac vessels we travelled ashore in were large and seemed to offer little challenge to the spirited septuagenarians who made a portion of the passengers. Passengers’ ages ranged from the twenties to a robust English 85-year-old widow. 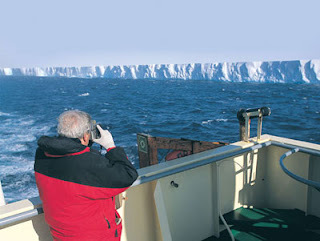 Many passengers had made earlier trips to Antarctica, either from New Zealand, or to the Antarctic Peninsula via southern Argentina. We had an experienced staff of scientists and adventurers, as well, and were carrying a number of young Australian scientists whom we were to drop off on Macquarie Island on the way home. Meals were informally eaten without the fixed seating of stuffier ships, and south of Campbell, conversation was lively as we kept an eye out for Our First Iceberg. When it came, it was an older pyramid-like iceberg, rather smaller than the huge tabular icebergs we would soon encounter, but like a first child, it was photographed from every angle. Similarly, our first brash ice, as we entered Antarctica’s skirt of ice, and our first pod of whales. Whales - orcas, minkes, humpbacks and southern right became so plentiful that on the bridge, where we passengers were welcome except during storms or difficult ice circumstances, no sooner would a pod of whales be announced ahead of us than someone would spot another on the port or starboard. Adelie penguins and seals populated the ice floes we sailed through, and ahead, in such clear air that one could see to the limits of visibility, the huge coast of Antarctica from Cape Adare westwards, the coastal mountains and glaciers, and the Trans-Antarctic mountains rose out of the sea. The landscape in Antarctica is really super-landscape. First of all, there is the extraordinary clarity of the air, which makes a glacier or a mountain fifty kilometres distant look as if it is only morning stroll away. Similarly, the great volcano, Mount Erebus, fuming away above its huge ice-slopes, looks like it could be scaled in a morning, whereas it takes expert climbers three days to ascend. As well as that, Antarctica is so un-marked by humanity. It’s landscape is so massive that no one race, no culture, religion or language has owned it. It is, in the best sense of the word, No Man’s Land. All landings, whether by helicopter or by Zodiac, were dependent on weather and ice conditions. What surprised me were the lengths to which the Russian captain and the American expedition leader would go to compensate us for landings which proved impossible. For example, a huge glittering array of ice and icebergs held Cape Adare in its grip, and to make up for the fact we could not land there, the captain took us looking for the world’s then largest iceberg, C-19, 200 kilometres long and some seventy to eighty kilometres across. When we encountered it in the Ross Sea, it stretched to the north-western and south-eastern horizons and towered above the icebreaker. So a champagne party was arranged atop the iceberg, and we were all lifted onto it, this world unto itself, by helicopter. Ice-breaking is an hypnotically engrossing exercise, particularly if viewed from the ship’s bows on a sunny day. And our first landing on the Antarctic mainland came after visits to a number of extraordinary ice tongues, extensions of glaciers, jutting forward into the sea. We came ashore at Terra Nova Bay where, with the massive mountains behind them, the Italians have a highly sophisticated research base, which they leave in winter but control from Italy by computer, so that much of its research continues unattended. We were then able to fly through the coastal mountains of Victoria Land and into the Dry Valleys, where glaciers end in great walls, leaving a grandly desolate bare terrain. This area offers so much information on the history of earth and sea, the condition of the Antarctic icecap in the past and future. One of these valleys is named after the Australian geologist Professor McKelvey, our geology lecturer aboard, who has spent a lifetime on the issues raised by the region - we nicknamed him the “Rock God”. He was our guide to issues of global warming and its impact both on the ice and on coastal civilisation everywhere. 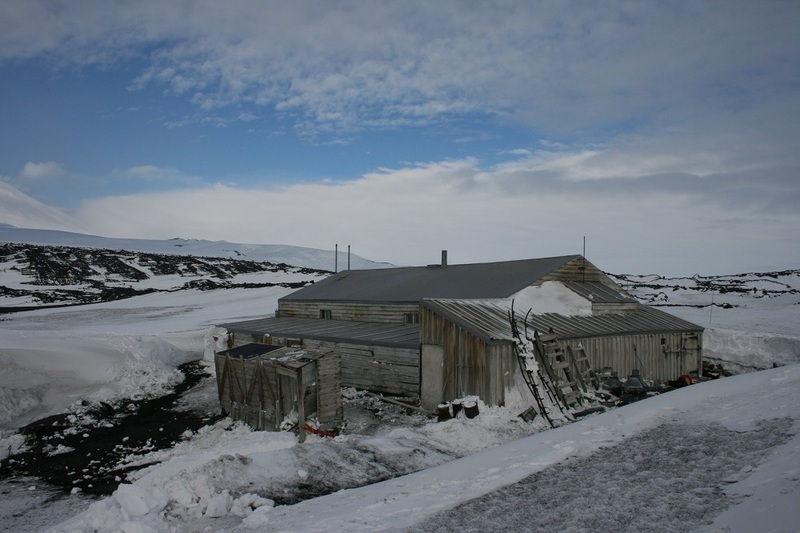 On the other side of McMurdo Sound, we visited the atmospheric and poignant huts of Shackleton at Cape Royds and Scott at Cape Evans. Since there was now 24-hour daylight, we journeyed to Scott’s hut on a cold, still, Antarctic evening, when the light and the overcast, created extraordinary contrasts between the volcanic soil and the ice and snow. Many Scott enthusiasts thought it was the best experience of the journey, and no one said they were wrong. For in all these Antarctic huts, there are boxes of biscuit and tins of cocoa, there are stoves, magazines, books, pieces of dog and pony harness all left behind on the day the men of the classic Antarctic expeditions had to run for the ship which would take them home. My mind was tickled by a number of Antarctic propositions of which I had not thought before. One is that the water in icebergs is older then human civilisation, coming from snow dropped five to ten thousand years ago on the polar plateau, whereas the sea ice is mainly one-year old. And the other is that Antarctica is the only continent where the first human habitations are still standing. C-19, helped by other giant bergs we saw, had trapped ice in McMurdo Sound. As we approached McMurdo base, we met two American Coast Guard icebreakers trying to make a path for a tanker to unload fuel for the Antarctic winter. The icebreaking here was loud and spectacular. No sooner were we through a stretch, than we could see the first plastic layer of ice re-forming either side of us and in our wake. We had to fly ashore in the helicopters to visit the extensive scientific installations at McMurdo. Now run by a scientific administration, rather than as in 1968, by the U.S. Navy, McMurdo ships out all its waste and garbage, and so do all other stations. So, by the way, do ships such as the Kapitan Khlebnikov. There is a dazzling range of research going at McMurdo and in the nearby New Zealand base, Scott. One of the most arresting issues is the ozone layer hole, which at the time of our visit had shrunk, giving momentary hopes that we were behaving ourselves environmentally. Sadly, I believe this decline in size proved merely temporary. Some of us climbed Observatory Hill, where the cross erected to Scott’s memory stands against the giant bulk of Erebus. Looking south, we saw the France-sized Ross Ice Shelf on which Scott had died on the way back from the Pole and across the Sound, the Royal Society Range. Coming north again, we visited and crouched amongst the Adélie penguins, chicks and adults, at the colony on Franklin Island, but spectacular Cape Adare was still icebound. All the way we had encountered the most exceptional combinations of icebergs, blue caves eroded by seawater at their base. Indeed, at Adare, safe in ice, we were able to watch the great continuous floes heaving around with the swell, as seals slept soundly all around, and penguins went about their age-old, Charlie Chaplin-esque business. Heavy seas stopped us landing at Macquarie Island too, and there was quite a drama getting our young scientists ashore in the Zodiacs. But at Lusitania Bay, the king penguins came out in thousands to see us, surrounding the ship, conversing and calling in their piercing voices. I loved the Khlebnikov, the experience of growling our way through the ice, the continent’s massive coasts. I went back to Antarctica, in fact, so that I wouldn’t become one of those old bores who keep saying they wish they had while they had their health. But I think the end result is that I got the bug worse than I had it in the first place, so don’t be surprised to see me on next year’s journey. Thomas Keneally, AO, is an Australian novelist, playwright, and essayist. He is best known for writing Schindler's Ark, the Booker Prize-winning novel of 1982 which was inspired by the efforts of Poldek Pfefferberg, a Holocaust survivor.